Jagram Harrogate Summerhouse Pavilion: The Jagram Harrogate Summerhouse Pavilion is a classically designed octagonal summerhouse with a spacious and light interior. Generous double doors and tall, toughened-glass windows provide ample lighting and ventilation, creating a cosy garden space for relaxing or entertaining. Its attractively crafted timber roof boasts a vaulted ceiling inside, and pointed wooden finials and bitumen felt shingle roof tiles on the outside. Tiles are available in your choice of either black, red or green, A strong wooden floor is included as standard, and all window and door fixtures are made from high quality British-made brass. The summerhouse's wooden components are responsibly sourced from Northern European Softwood forests and crafted by Jagram's expert craftspersons to a high specification. All wood is pressure impregnated with an advanced formula wood preservative, meaning that it is guaranteed for ten years against decay, insect attack, and weathering. 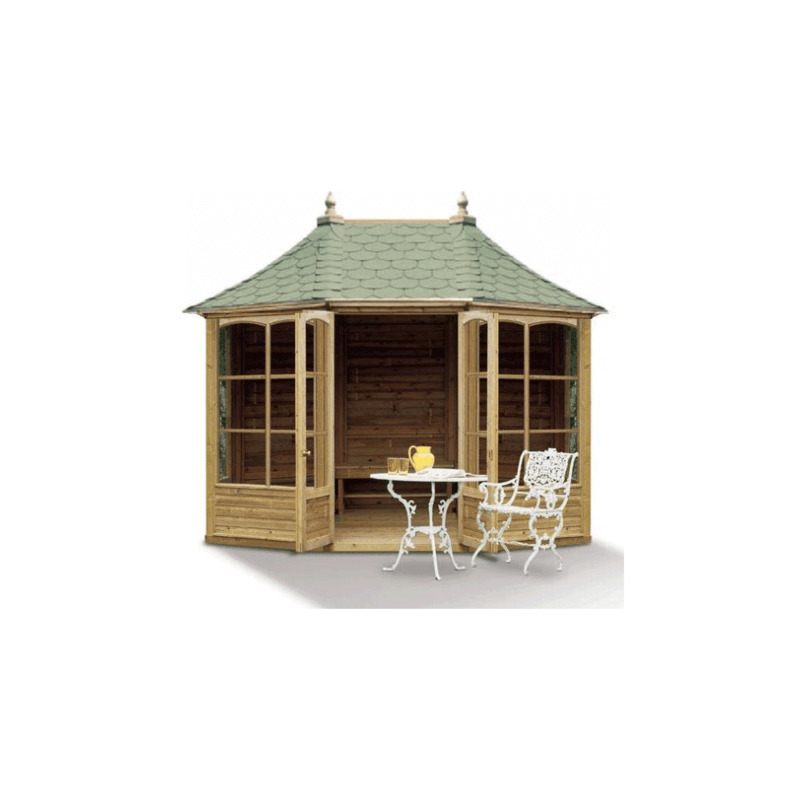 This sturdy, beautifully designed summerhouse is a versatile and attractive garden building that will provide years of garden bliss. Please note that if a plain timber roof is used without felt shingles no guarantee of weatherproofing can be made, Shingles should be fitted to provide protection from the elements.